The Lyme Bay Experimental Potting project was commissioned by DEFRA and funded by the Blue Marine Foundation in order to assess the impact of static potting on benthic reef habitats as well as commercially targeted species within the Lyme Bay MPA. Carried out by Dr Adam Rees at the University of Plymouth, the project was set up partly in response to concerns raised by local fishermen about the potential for an increase in static potting in response to mobile fishing being banned from inside the Lyme Bay MPA. Starting in 2013, this project has manipulated potting densities across sixteen experimental treatment areas to create a gradient of potting effort from no potting through to low, medium and high levels. Inside these areas, towed and baited video data have been collected in order to assess changes in benthic and mobile assemblages in response to increasing potting pressures. 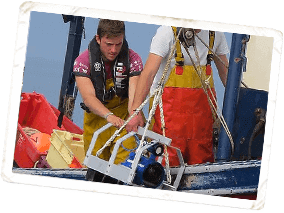 Additional quantitative catch data was collected to monitor the commercial catch composition of mainly brown crab and lobster, the species primarily targeted by potting in Lyme Bay. This work has been done in partnership with local fishermen onboard their vessels. The results and final report are currently being reviewed by DEFRA.